Hey, Y'all Charlie here again.....It's been awhile, but I've been a little busy having surgery done. Since I am planted on the couch for awhile, Emily thought it would be the perfect time for me to write some blog posts. 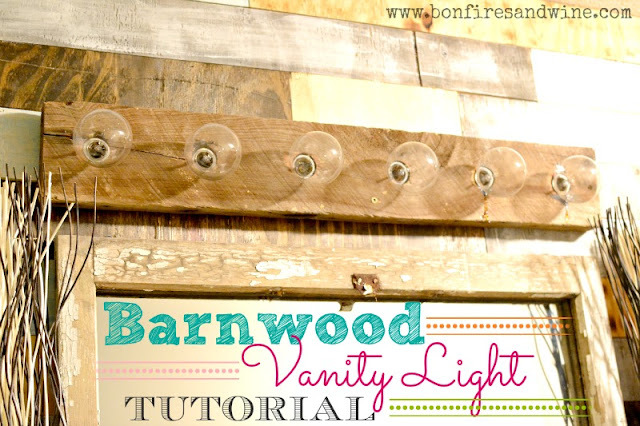 So, I figured I would show you guys how I made a homemade barnwood vanity light for our newly remodeled bathroom. This isn't any ordinary light you could buy at local hardware store; or is it? Take your light and remove the front cover, exposing the wiring and bulb sockets. Don't be alarmed, I hate electricity and if you can screw in a light bulb, you are an electrician on this project. Make sure that your barnwood is thick enough that the light sockets do not stick out too far and are exposed, or that they are too far down so that a bulb cannot be screwed in. This piece of barnwood that we used is about 2 inches thick. Ok, this is where the craftsman and not the blogger comes into affect....I jumped ahead of myself before I snapped some pictures. SIGHHHH....(from Emily). As you can see, I had already started to drill some holes, but you didn't miss anything important. I placed the metal light fixture on the board and got it centered. Once I like where it was I traced a line with a pencil all the way around all of the light sockets. 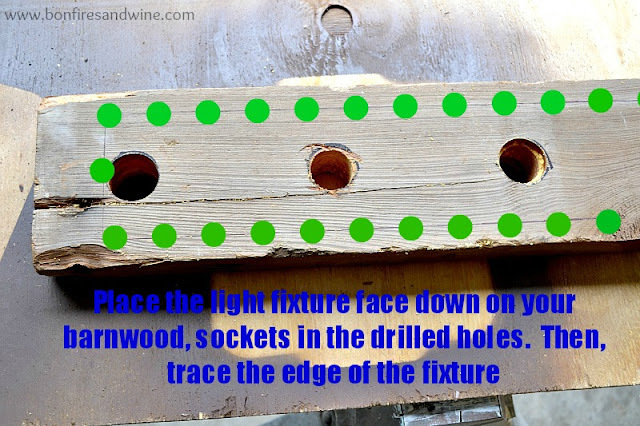 After you have your holes drilled in your wood, place your light fixture on top of the wood, sockets into the holes, and push down so that the metal is touching the wood. Now take a pencil and trace around the perimeter of the light fixture. This time I have a valid excuse as to why I don't have a picture of the the next step. Not safe to take pictures while using power tools. Once your line is traced you can use a circular saw and cut exactly on your line. 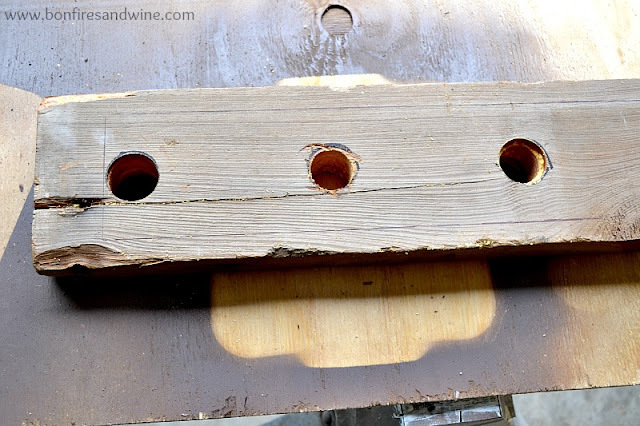 Make sure you set the depth of your saw as to not allow the blade cut through your board, but also make sure it as deep enough for the light fixture to sit into the wood. 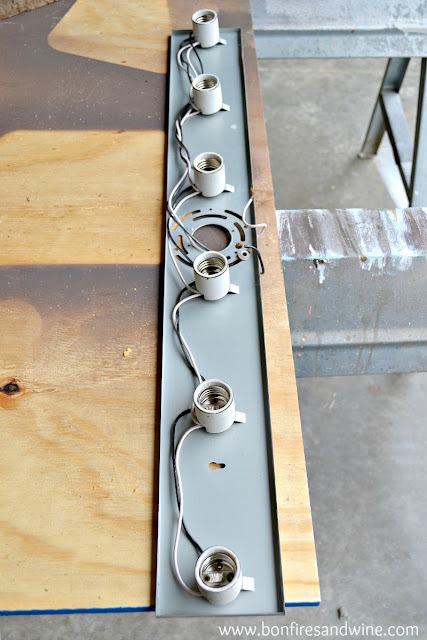 Now that your fixture is sitting flush, you can run some screws into the wood, being careful not to hit any of the wires. 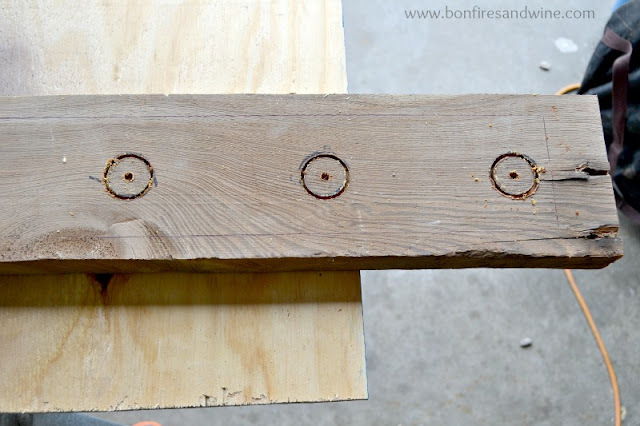 And, of course use short enough screws so that they don't go all the way through the barnwood. 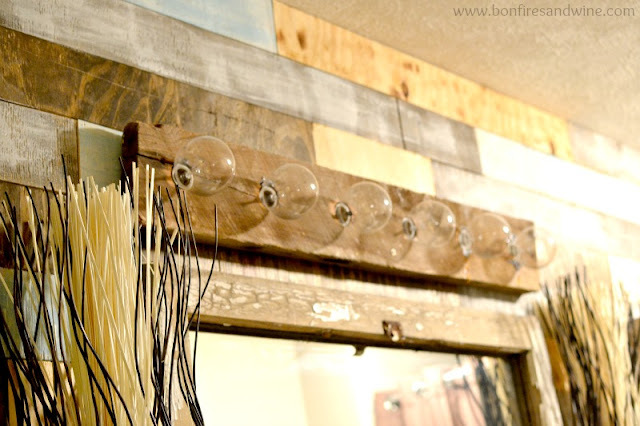 Now screw in some light bulbs and you've got yourself a one of a kind vanity light! What do y'all think??? It was just the touch our bathroom remodel needed and it didn't cost us a thing! FREE is always the best kind of project, right!?!? Thus as possible notice there is right now a new need pertaining to a lot more electric electrical sockets as opposed to regular three pin number connect electrical sockets, even so which has a row of 3 or 4 bright plastic-type electric electrical plug sockets within the walls could glimpse slightly unsightly and you'll would like to opt for a far better searching end. I loooove this and want to do the same thing in 2 bathrooms. The only thing I'm confused on is how it is actually mounted to the wall. Do you screw the fixture to the wood from the back? Then how do you mount it to the wall? I would love to know how you did this step. The ONLY way to cook corn on the cob!